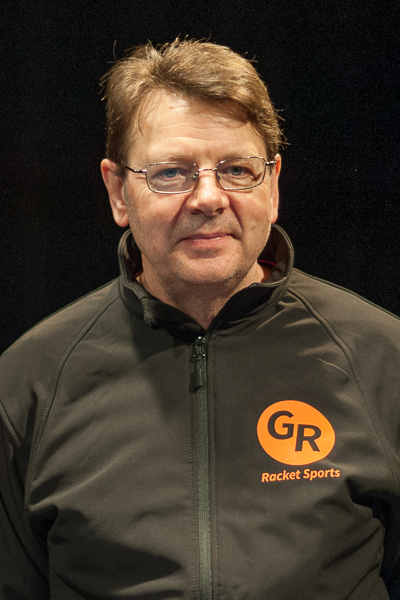 Miles Ross joined Gavin Rumgay Racket Sports in 2014, and has been instrumental in helping Gavin grow the business to where it is today. His business acumen as well as his extensive coaching experience have been put to full use. As well as coaching clients in Table Tennis, Tennis and Badminton, Miles also coaches Gavin, both in UK table tennis tournaments and on the ITTF World Tour. In fact, the sharp-eyed spectator would have seen Miles in several top players’ corners in major tournaments. Most recently he could be seen in Gavin’s corner on TV, in the latter’s match in this year’s World Championships against Timo Boll. But, Gavin is not the only one to benefit from Miles’ tactical awareness in table tennis as he has coached other international players, including Grand Prix winner Mike O’Driscoll and Scottish international, Niall Cameron. Miles’ strength as coach lies not just with his tactical nous gained from his years of experience as a player but also his knowledge of the psychological side of high performance sport. He is able accelerate the performance of each his clients beyond normal expectations due to his unique understanding of table tennis and their own individual style.